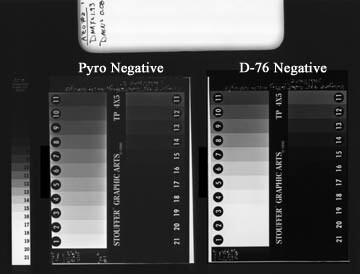 Early in 2002, Dan Smith proposed an experiment to print the negatives I used for my Effects of Pyro in Platinum Printing article on Azo paper, develop them in amidol, and compare the tonal scale of the resulting prints to platinum prints from the same negatives. I have used Azo for many years as a proofing paper for my 8x10 negatives but had never seriously considered it for fine prints because of what I deemed to be an objectionable bluish color when developed in Dektol – my stock paper developer. I have always liked Azo because I recognized early on that it has a similar tonal range to platinum and provides me a good indication of how the negative would print in platinum. But I couldn’t get past the blue color since my vision is warm tone. My interest in amidol had recently stirred again as I looked for a silver paper on which to print my 12x20 negatives and the obvious choice was Azo – but that blue color! I began to read articles on the web about the color shift that amidol imparted to Azo. I had some earlier experience with amidol when about thirteen years ago I tried it to develop Portriga Rapid. But the tonality of the prints was almost indistinguishable from prints developed in Dektol so I shelved the amidol. This sounded like an interesting project so Dan sent me some grade 2 and grade 3 Azo and some amidol in Michael Smith’s formula. Between writing, teaching platinum workshops, and starting to work with a 12x20 camera, the experiment was delayed until this last fall, but the delay has proven to be a turning point in my opinion about Azo and of silver printing in general – this from someone who has printed pretty much exclusively in platinum for 11 years. The day I made the test prints happened to also be the day I printed the first of my 12x20 negatives. I had ordered some 20x24 Azo from Michael and Paula so I mixed up a half gallon of amidol and decided to make some proofs of the 12x20 negatives in the same printing session. I was immediately taken by the dramatic difference in print color that amidol imparted to Azo. The prints were warm. The bluish cast of Dektol was gone. I’m sure it also helped that I was seeing my very first 12x20 images, a rush in and of itself. After several printing sessions, I came to the conclusion that the Azo/amidol prints were suitable for mounting and framing – not just proof prints. I didn’t expect this! In fact, I have been so derailed by this paper-developer combination, I have yet to make any platinum prints from the 12x20 negatives. There will be plenty of time for that this winter. But I digress from the original purpose of trying amidol with Azo paper. The question was simply, “How does the tonal scale of Azo prints developed in amidol compare to platinum prints?” I read the Azo test prints with my X-Rite model 820TR densitometer, which I used for the platinum and silver prints made for the “Effects of Pyro” article. I included a Stouffer step wedge strip in all prints and attempted to adjust print times such that step 5 of the Stouffer reference printed with the same density to my eye. As the reflective densitometer data shows, the prints were within 1/3 of a stop (0.1) on step 5. An opaque object was also placed over a part of the paper during exposure to establish paper-base reflective density values. The grade 2 print is shown below. 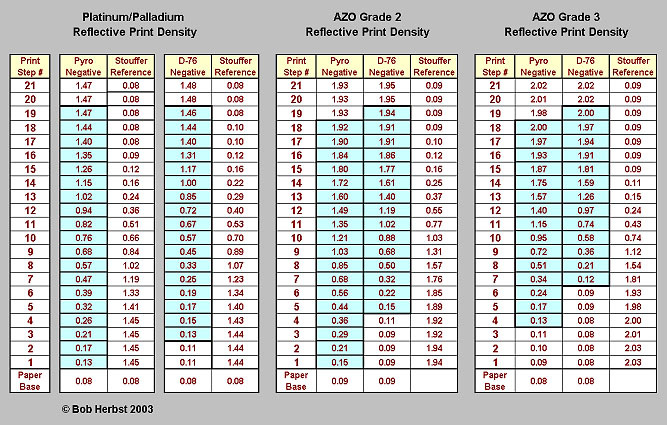 The raw print reflective print density data and are in the table below. The sensitizer/metals mixture for the platinum print used in these tests and comparisons contained a very small amount of potassium chlorate for contrast and fog control. The mixture contains the equivalent of one drop of Solution #2 for Platinum by the B&S chemistry i.e. 4-1-3-2 drops of FeOx#1 – FeOx#2 – Pt – Pd respectively. The pyro negative prints almost identically in platinum and on Azo grade 2 in terms of tonal range. There is only a half stop difference, which provides the benefit of being able to move back and forth between Azo and platinum/palladium with the same negative. The separation of tones is excellent from shadows to highlights. The prints exhibit a warm tone more toward green than yellow, but still very pleasing. The Azo grade 3 does the job for which it was designed. It takes a lower contrast range and stretches those tones across a wider range. I used it for a number of the early 12x20 negatives before I had zeroed in the development concentrations, temperatures, and times for the new films. 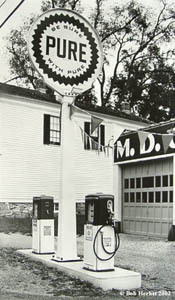 Azo is a longer scale paper than the platinum print in terms of reflectivity. 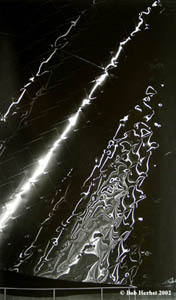 A glossy silver paper such as Azo has a deeper black (DMAX) than the platinum print by between one and a half to two stops (0.46-0.54 in density) in reflective density. However, the platinum print yields about ½ to1 stop more in range of subject brightness than Azo (prints more steps of the wedge). This is an important and often misunderstood distinction. The platinum/palladium print can render or reproduce a longer scale of subject brightness as contained in the negative i.e. more shadow detail or more highlight detail, or both, than a silver print made from the same negative. The longer subject tonal range in the platinum print (9.5 stops) is compressed into a shorter reflective tonal range (1.5 DMAX = 5 stop reflective density range) in the platinum print. In the Azo print, a shorter subject tonal range (9 stops) is spread across a longer reflective tonal range. (1.95 DMAX = 6.5 stop reflective density range). Working with Azo has become a somewhat liberating experience in terms of returning to the basics of photography without a lot of fancy enlarging equipment, digital timers, special light sources, filters, light integrators , and lenses. Azo is a very slow paper and while I know many people who use their enlarger as a light source, the resulting exposures are far too long for my preferences. I use a very simple set up which harkens back to the crude methods used by Edward Weston to print his negatives. I use a plain 100 watt soft white light bulb in a 10 inch reflector suspended about 3 feet above my printing frame. I used to use a heavy piece of glass on foam rubber for my 8x10 proof prints. The larger 12x20 negatives required better registration between negative and paper so I salvaged a basic 16x20 vacuum frame from an old Agfa copy camera. The vacuum frame is a luxury in this context. I make all of my Azo prints using this set up. I want to express my appreciation to Dan Smith for providing the materials for this project and for his patience in waiting for me to complete it. The ebb and flow of time and space does not always result in things getting done when I would like. It was a busy year and a good year. Discovering the Azo-amidol combination has added a new dimension to my work, providing options which did not previously exist. 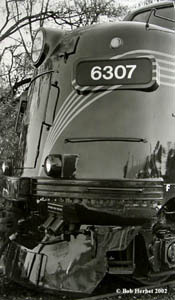 Copyright 2003 by Bob Herbst. All rights reserved. No portion of this article may be reproduced by any means without the express permission of the author.